Monday morning, the only time of the week that I wish that I was a coffee drinker. As I was walking to work today I noticed numerous signs up indicating that it's going to be another busy day of Hollywood movie filming. I'm not sure which movie they're working on (The Women, Bachelor No. 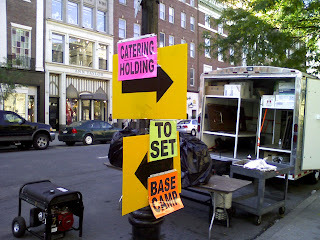 2, Pink Panther 2) but they were setting up filming equipment in the Public Garden and then setting up catering equipment near the intersection of Newbury St. and Arlington St. So if you're a star-gazer and have the day off today (lucky you) head over and see if you can see some celebrities. If you happen to snap a picture, send it to me and I'll post it for all to see. 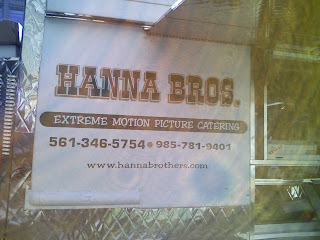 Your guess is as good as mine as to what exactly "Extreme Motion Picture Catering" entails and what could possibly make catering "Extreme." 5 Response to "Movie Filming in Boston - 9/24/07"
It's not The Women... the signs aren't right. I work in the Theatre District and we had tons of stuff going on last week with these films. I like it all the activity. I live near Washington Square in Brookline and they were on Beacon Street in a building next to Vinny T's.